This contemporary mini pendant light features an artisan-blown bubble glass shade in muted green. Sparkling, slim, and sweet, the Juni 10 contemporary mini pendant in moss by Besa will brighten your home with its modest and playful modern elegance. A cylinder moss bubble glass shade is artisan blown for a unique rippled effect and a sleek suspension cord and canopy finished in bronze complete this contemporary classic. The Juni will bring its luminous bubbly charm to your kitchen, lining the hallway, or showcasing the dining room in pairs. 10" high x 3 1/2" wide. Round canopy is 5" wide. Weighs 4 1/2 lbs. Contemporary cylinder mini pendant part of the Juni 10 collection by Besa. Handcrafted moss green bubble glass. Because the glass is handmade, there may be slight variations in pattern and color. Can the Besa Juni 10 3 1/2" Wide in Moss Green Glass Mini Pendant - Style # 8Y813 be purchased in satin nickel finish instead of bronze? (the blue one can be, so I'm hoping the green can). Thank you. 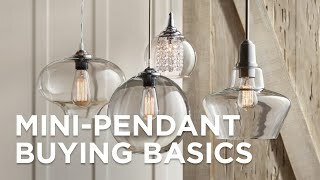 Do you have this in a multiple light pendent to go over an island? BEST ANSWER: We have different style numbers like #35H79 but the best thing would be to speak with one of our lighting specialists by calling 1800-782-1967. Is it possible to hang this with a downrod instead of the wire? BEST ANSWER: Unfortunately, the pendant cannot be hung with downrods. It would be possible to make it look as if it were hung from a downrod though. If you used a hollow rod with a larger inside diameter than the short rod extending from the top of the fixture, that rod (and the wire) could go inside it. It would still be supported by the wire though. How true to color is the green that is viewed on line? BEST ANSWER: Hi Donna - We think that it's similar to the green online, a very muted green tone. But please note that the color tone changes depending on the color temperature of the light bulb you use with this light.